Due to be renovated, the top area of Angkor Wat is close for visitors for a while. But, hey look at that couple. They didn't care about the "No Access" sign. They had crossed the border and climbed the temple. 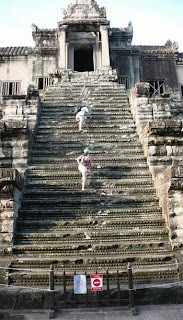 I captured this moment when visited Angkor on Monday morning, May 26, 2008.